Citation Information: J Clin Invest. 2007;117(3):757-764. https://doi.org/10.1172/JCI29968. Alveolar macrophages (AMs) express the class A scavenger receptors (SRAs) macrophage receptor with collagenous structure (MARCO) and scavenger receptor AI/II (SRA-I/II), which recognize oxidized lipids and provide innate defense against inhaled pathogens and particles. Increased MARCO expression in lungs of ozone-resistant mice suggested an additional role protecting against inhaled oxidants. After ozone exposure, MARCO–/– mice showed greater lung injury than did MARCO+/+ mice. Ozone is known to generate oxidized, proinflammatory lipids in lung lining fluid, such as 5β,6β-epoxycholesterol (β-epoxide) and 1-palmitoyl-2-(9′-oxo-nonanoyl)-glycerophosphocholine (PON-GPC). Intratracheal instillation of either lipid caused substantial neutrophil influx in MARCO–/– mice, but had no effect in MARCO+/+ mice. Normal AMs showed greater uptake in vitro of β-epoxide compared with MARCO–/– AMs, consistent with SRA function in binding oxidized lipids. SR-AI/II–/– mice showed similar enhanced acute lung inflammation after β-epoxide or another inhaled oxidant (aerosolized leachate of residual oil fly ash). In contrast, subacute ozone exposure did not enhance inflammation in SR-AI/II–/– versus SR-AI/II+/+ mice, reflecting increased AM expression of MARCO. These data identify what we believe to be a novel function for AM SRAs in decreasing pulmonary inflammation after oxidant inhalation by scavenging proinflammatory oxidized lipids from lung lining fluids. 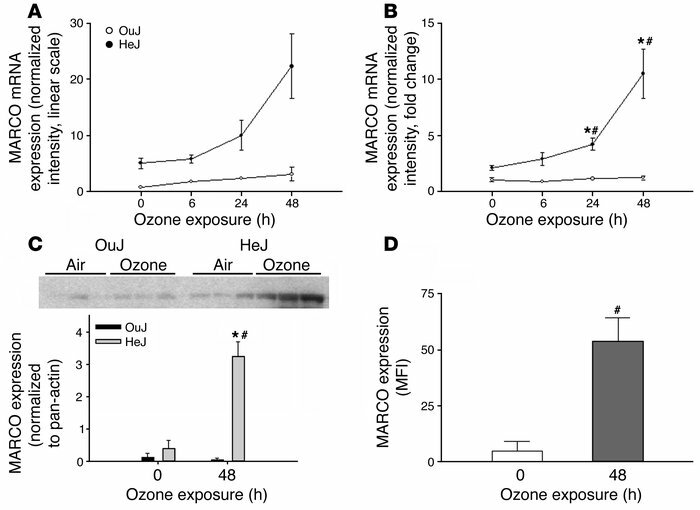 Ozone upregulates MARCO in lungs from ozone-resistant HeJ mice. HeJ or congenic ozone-sensitive OuJ mice were exposed to 0.3 ppm ozone for up to 48 hours. Microarray analysis (A) and RT-PCR (B) were performed on total RNA isolated from lung samples and showed increased MARCO mRNA expression in HeJ mice (filled symbols) compared with OuJ mice (open symbols). (C) Western blot analysis of lung tissue obtained after 48 hours of ozone exposure also showed increased MARCO protein expression. (D) Ozone upregulates MARCO on the surface of AMs of C57BL/6 mice exposed to 0.3 ppm ozone for 48 hours, as shown by increased fluorescence after flow cytometric analysis. Results shown are representative of 3 independent experiments. MFI, mean fluorescence intensity. *P < 0.05 versus ozone-treated OuJ; #P < 0.05 versus air-exposed control.